Today was to be my last full day in San Francisco. I wasn't planning to overdo it, considering my flight back East was departing at 6:00am Monday morning. Plus, the Celebrator Anniversary Party was going to inflict enough damage on me for one day. I figured the day might start off nicely with Brunch over in Oakland at Barclay's with Beer Chef Bruce Paton. His dinners have a legacy that's rarely matched. Recently, he's been uprooted from the Cathedral Hotel (which was demolished) and he's in the process of looking for a new home for his beer dinners in the Bay Area. The menu and the beer selections looked incredible. Then, I figured I might hop back to Humphry Slocumbe for some beer ice cream if I hadn't already been by there. Or the City Beer Store for some "to go" goodies for my friends back home...Vanberg & Dewulf is having an event there during the afternoon. My Sunday certainly won't be as big and crazy as it would have been out West. Patty and I rarely do anything too special for Valentine's Day. It's looking like we'll hunker down with a day of relaxation and home cooking. 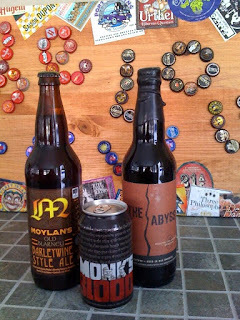 Beers of choice will likely include The Abyss from Deschutes Brewery in Oregon (first time ever tasted was two years ago at Celebrator 20th Anniversary Party), Monk's Blood from 21st Amendment (still one of my favorites of the past several months), and Moylan's Old Blarney Barleywine (with fond remembrances of stopping in with Jay Brooks several years ago to meet Arne Johnson of Marin and James Costa at Moylan's). The one thing I actually do like about cross country plane travel is the ability to disconnect. No phones, internets, household chores, or other distractions. It means that I can take the 5-6 hours to catch up on reading and listening to podcasts. Maybe I can carve out an hour or two at home today to get some of this reading stack conquered. Well, my friends. I'm not sure how many of you are checking in from California this week, given your preoccupation with SFBW '10. But, I do really appreciate the hospitality that was being offered to me in advance and the ability to plan an event with you and the knowledge that the SF Beer Community is one of the best in the country that really knows how to come together for a solid 10 days of Beer Week. See you in Philly in June. Cheers!